After I made such a fuss about catching a sapsucker and a hummingbird early in the season, of course, we caught another sapsucker and another hummingbird. These guys are no longer quite so unprecedented—although they were novel species for me—but they are still awesome. Note the strong feet for gripping bark. 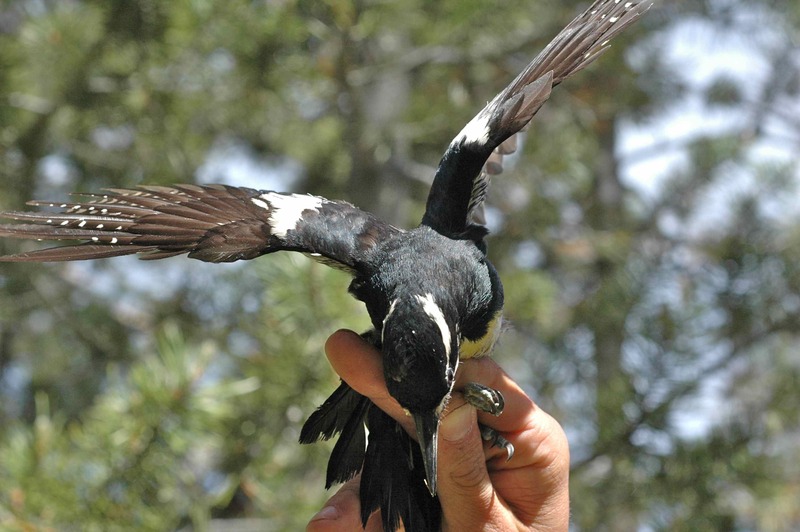 Like other sapsuckers and woodpeckers, his feet are zygodactyl: that is, two toes pointing forward and two pointing back. Juncos’ feet, in contrast, are anisodactyl: three toes in front, one in back. 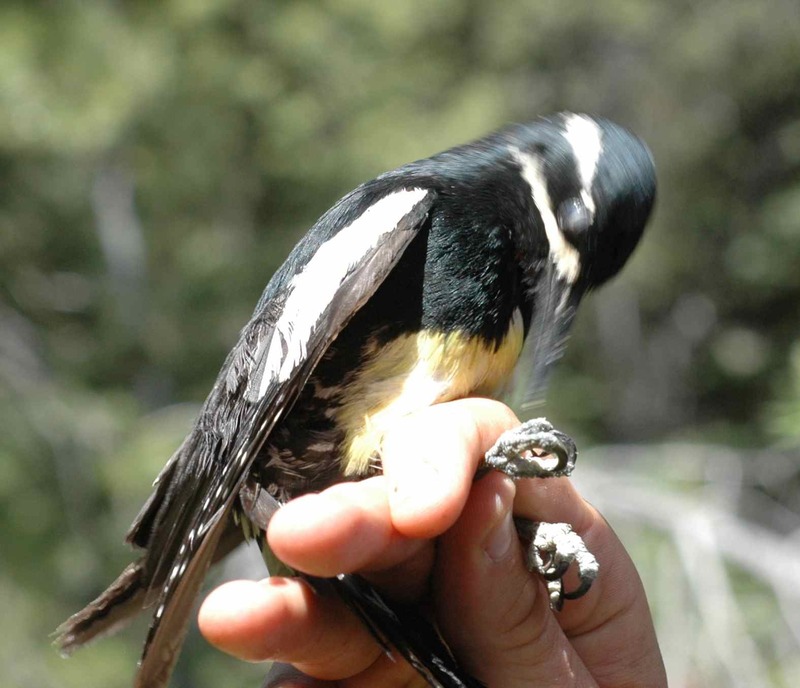 His tail feathers are stiff; they act as a prop when he clings to the side of trees. 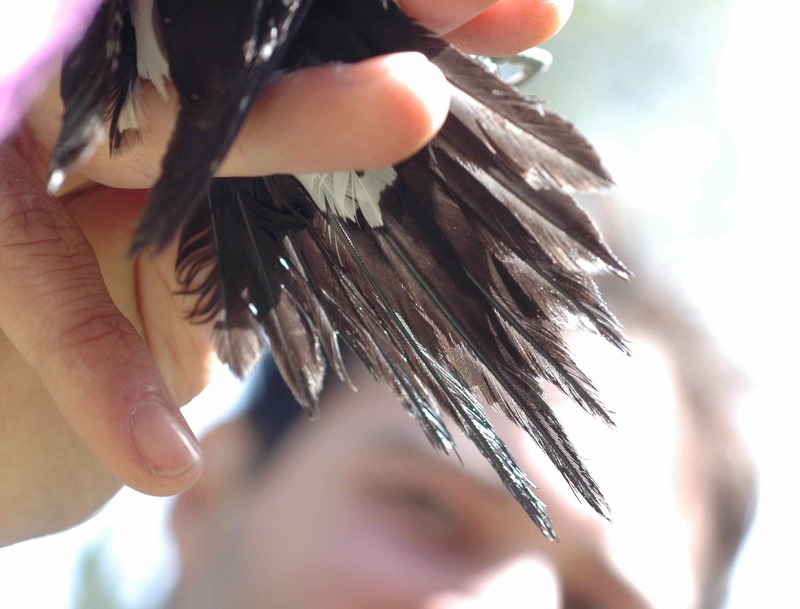 Brown Creepers, which are not woodpeckers but move on trees in a similar way, also have stiff tail feathers. 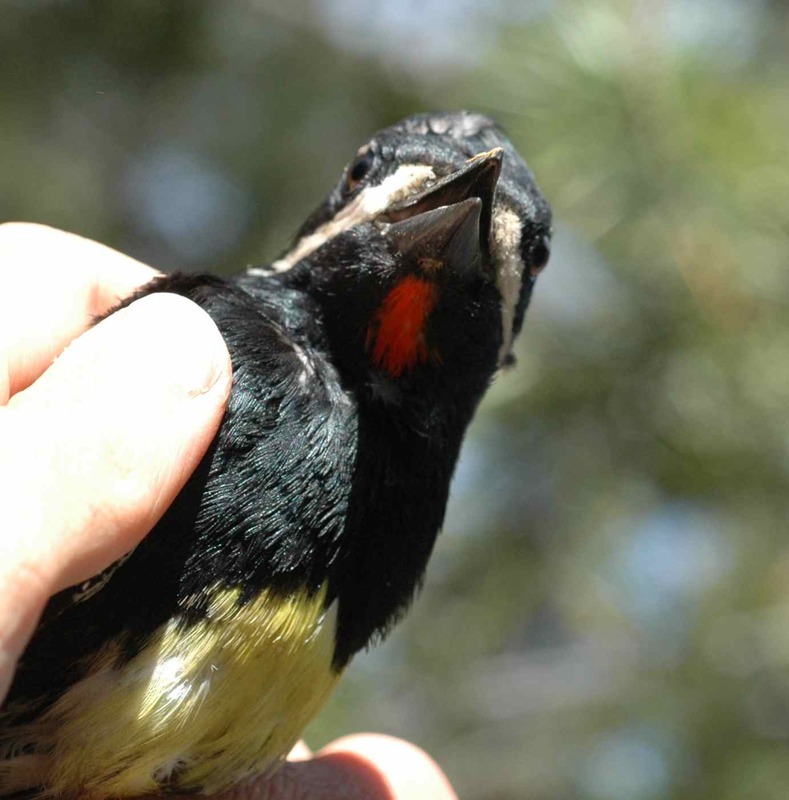 He pecked at us rather more emphatically than the Red-breasted Sapsucker had done, and after I had held him I was impressed to find that he had managed to draw blood from my hand—although he still did less damage, for all his effort, than my cat can do with one absent-minded swat. 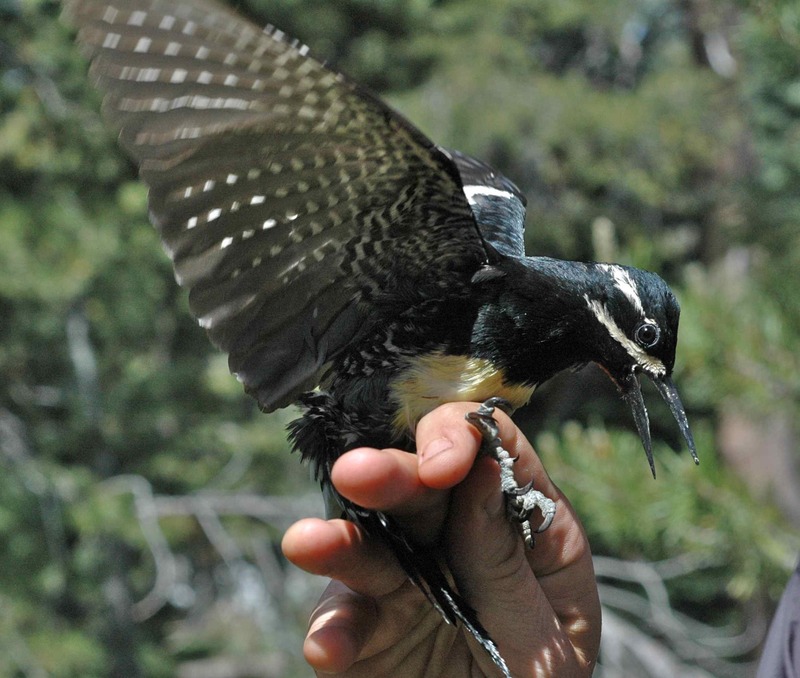 We actively try not to catch hummingbirds since they are tiny and fragile, but this little guy got in anyway. 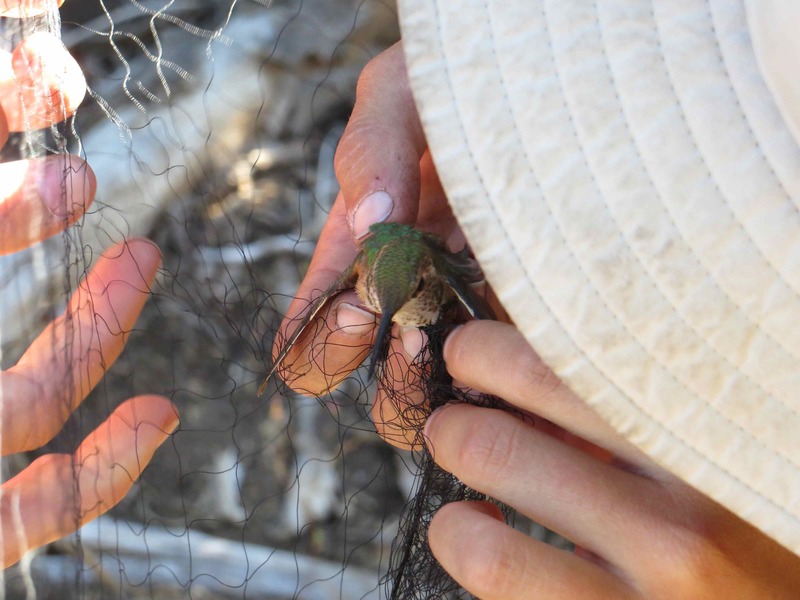 All the photos were taken by one of my field assistants as I worked to extract the bird from the net: that’s the brim of my hat, and you can see that another of my field assistants is helping to keep excess net out of my way. 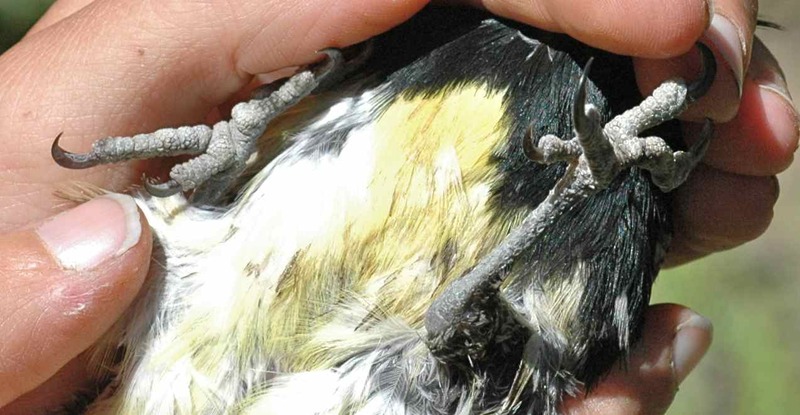 Sometimes when birds are badly tangled in the net, we cut the net—but we have to be careful with this, because the worst thing that could happen would be for a bird to escape with a bit of net still attached to it. 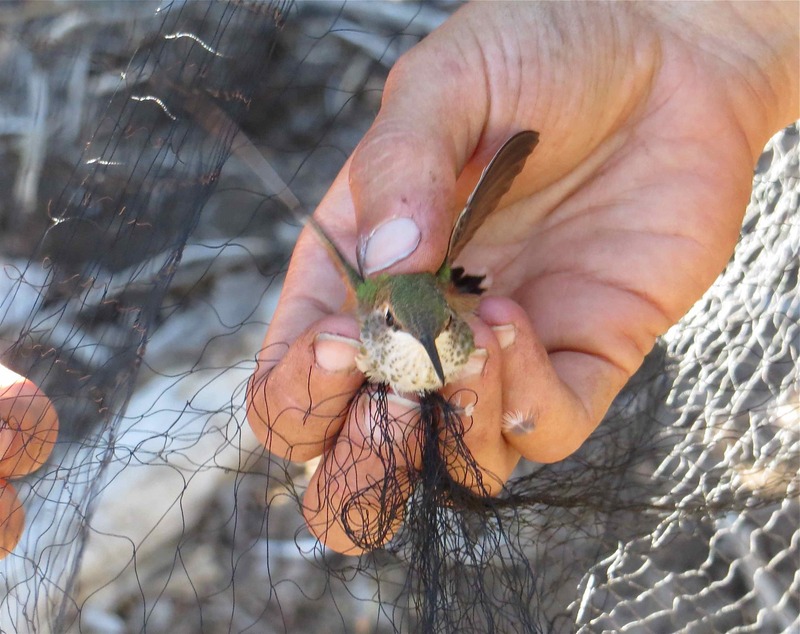 Better to keep the bird in the net as long as it takes to get the net off than to cut the net wrong and leave the bird trapped in a bit of net forever. 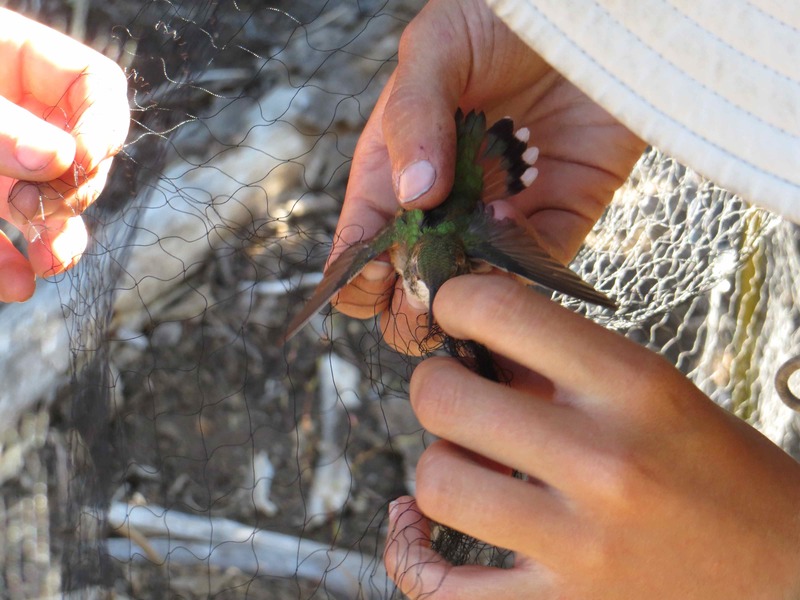 The surprisingly thick and soft feathers on the hummingbird’s neck meant that I couldn’t see well enough to cut the net there, so I just had to keep pulling the net over his long bill over and over. Finally I got him free and he buzzed off immediately, leaving us all relieved and slightly stunned. 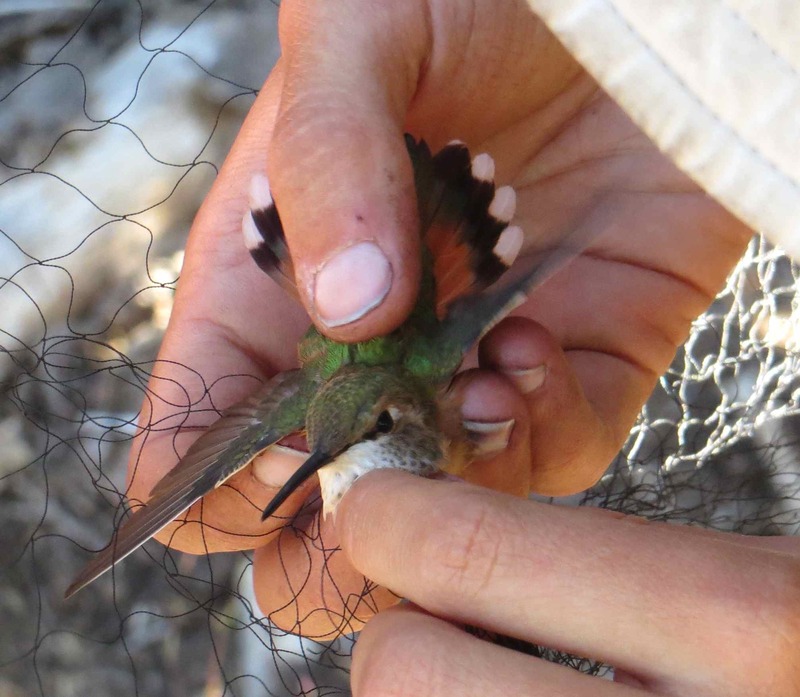 This entry was posted in bycatch, field work and tagged Allen's Hummingbird, birds, bycatch, mist netting, photography, Rufous Hummingbird, Williamson's Sapsucker by toughlittlebirds. Bookmark the permalink. 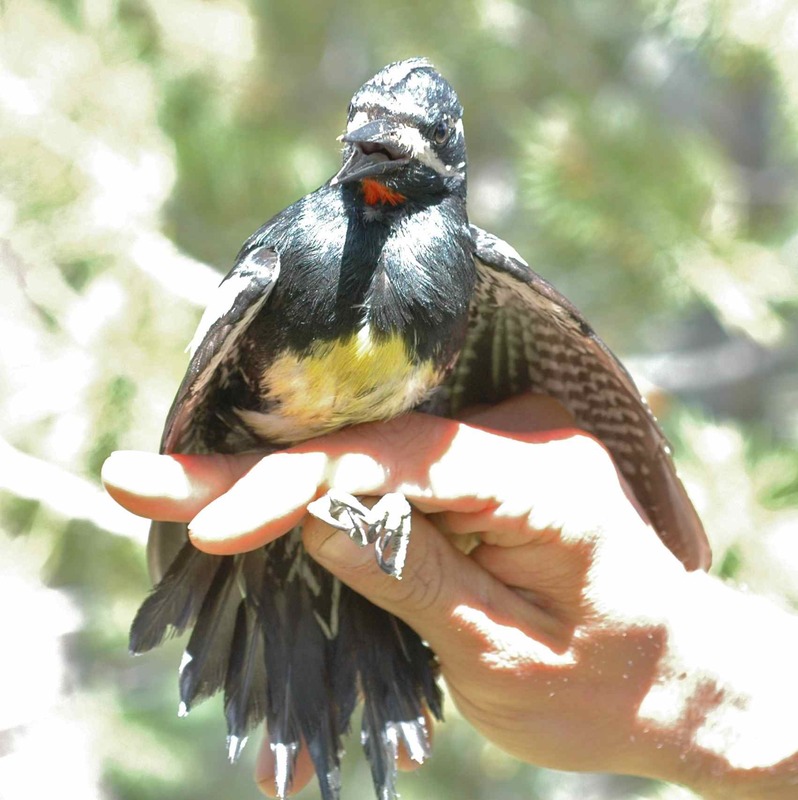 Who’s the cute bunchy little bird in your top band, grey with black wingtip and no neck at all, tiny eye and beak, sitting on a branch among pine cones and needles? A junco of course! All of my header photos are of juncos. That one is KEAR, I think, although it might be RONA. They were sibling fledglings (hence the patterned grey plumage and dark bill) that we banded on a cold, drizzly day (hence the unusual fluffed-up-edness, making the eye and bill look relatively small). Katie, I just subscribed to your blog. I am glad you visited mine and I am looking forward to your articles. I love your photos of the hummingbird in the net. I have witnessed several bandings and I can understand the difficulties involved. Thanks Bob! I’m always amazed by your photos.